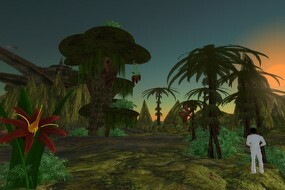 For those of you who 1) Don't read Boing Boing everyrday and 2) are interested in Second Life, I felt the need to re-distribute this post of Cory's. My commentary is below. Wagner James Au sez, "While taking a break from the UK game industry to raise her child, a programmer created a self-contained ecology on a Second Life island, with numerous species and natural phenomenon that must work together to keep the system function: clouds rain on the land, nourishing the plants (which also respond to sunlight), bees spread pollen to help the plants reproduce, birds eat seeds to keep the plants from growing out of control, and so on." If I was to turn off the clouds the whole system would die in about six hours," Laukosargas Svarog tells me. "Turn off the bees and [the plants stop] growing, because nothing gets pollinated. And it's the transfer of pollen that signals the plants to drop seeds. The seeds blow in the wind, and if they land on good ground according to different rules for each species, they grow when they receive rain water from the clouds. It's all interdependent. I haven't checked it out in person (or is that "in person") yet, but plan to very soon. If you SL, then here's the SLURL. Anyways, it's a bit inspiring. I need to spend more time in Second Life. And I should read New World Notes more often. Cya in the metaverse/grid/matrix/SL/whatever... Look for Zero Division.